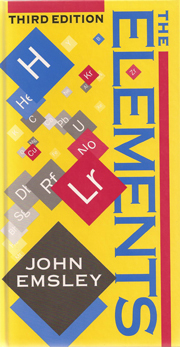 The Elements is a compilation of data, in alphabetical order, of all the main properties of the chemical elements. The properties include chemical data, physical data, biological data, nuclear data, electron shell data, crystal data, and geological data. The book also includes the derivation of the name, the discoverer, the date of discovery, etc. There is a final chapter on the development of the periodic table. This started out life as a data book of chemistry, which never materialised, although I did completed the section on the elements. This languished in a drawer in my desk until one day a representative of Oxford University Press called to tell me about their latest books and casually asked if I'd ever though of writing one. When I showed him my elements manuscript he realised that it was a book in itself, and within a short while it appeared and went into printing after printing. However, the third edition was sabotaged by a lecturer at Sheffield University who had been commissioned to transcribe it into a digital format. Unbelievably, he loaded it completely on to the Sheffield University website. The elements in alphabetical order. These consist of key data about every element providing the basic data of atomic number, relative atomic mass, date of discovery and discoverer, origin of name and its name in French, German, Italian and Spanish. Description, radii, electronegativity, effective nuclear charge, standard reduction potentials, oxidation states, covalent bond data. Melting point, boiling point, critical temperature, critical pressure, enthalpy of fusion and enthalpy of vaporisation, thermodynamic properties ΔH, ΔG, S, and Cp, density, molar volume, thermal conductivity, and mass magnetic susceptibility. Biological role, toxicity, hazards, level in human blood, bone, liver, and muscle. Daily dietary intake and total mass in the average person. Nuclides, atomic mass, natural abundance, nuclear spin, nuclear magnetic moment, uses. NMR (relative sensitivity, receptivity, magnetogyric ration nuclear quadrupole moment, and frequency). Ground state electron configuration, term symbol, electron affinity, ionization energies, electron binding energies, main lines in atomic spectrum. Crystal structure, X-ray diffraction mass absorption coefficients, neutron scattering length, thermal neutron capture cross-section. Minerals, chief source, world production, reserves, specimen availability, abundances in sun, Earth's crust, atmosphere, seawater (plus residence time), oxidation state. Tables of elements in order of atomic number and alphabetical chemical symbols.